One pleasure when writing on Guysborough County’s rich history during the Second World War has been meeting its people. This was especially true in meeting with the people who were actually there! Looking around Guysborough County today, you would think that nothing of importance ever happened in such a small place. But many important things did happen there. Guysborough County was situated in a very important strategic location during the Second World War. My most recent endeavour was “The story of No. 5 Radar Unit – For the Good Times” that recounted the tales of Sergeant Mickey Stevens (RCAF). Mickey served in and wrote about his stay at Cole Harbour during the war. We were in Mulgrave the very day the first in the series of Mickey’s stories were published in the Guysborough Journal on 6 July, 2016. It happened that my wife Melodie and I were out visiting the Mulgrave Museum looking for more information for a follow up on the article. I was exploring the story of the Royal Canadian Army Service Corps (RCASC) in Mulgrave. The 1st Fortress Company Det (RCASC) was amongst the many units posted there. The 1st Fortress Company Det (RCASC) serviced all military units in the area. Their service interested me as I am a retired logistician of the Canadian Armed Forces and a former member of the Logistics Branch. The Logistics Branch will be celebrating its 50th Anniversary, 2 February 2018. My research was geared to writing an article for their newsletter in celebration of that event. I was shocked to say the least. After all these years, an eye witness was around to recount the events of Ed Flower’s death. You may recall that Ed Flower was a servicemen heading home on Christmas leave out of Cole Harbour NS on 20 December 1944. His story is found in “It’s the most wonderful time of the year”. Leslie was there and was able to provide some additional details and insights to what happened that dreadful day. Furthermore, Leslie’s story is a great insight into the life and times of a young boy living in Halfway Cove before, during and after the war. Leslie’s story is a most interesting and compelling tale. Small group of airmen prepared to walk across the “Barrens” home for Christmas leave. Foreground Marvin Miller behind the group, Norman Paquet at the right, behind the toboggan buttoning his coat. 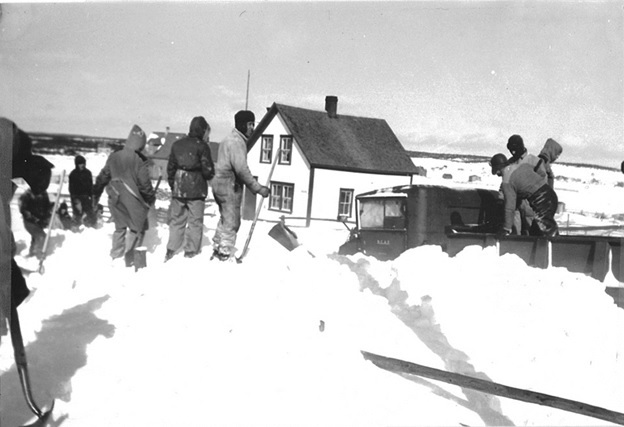 Man with the white cap is Ed Flowers watching Mickey Stevens attaching the luggage to the toboggan. Leslie now 85 years old, was only a young boy of 14 at the time this tragic event occurred. But Leslie’s memory of the day is sharp as a tack. Leslie recounted his life story in remembering this sad event. Leslie was born 24 March 1931 at home in Halfway Cove, delivered by a midwife, which was fairly typical in the day. Sadly, his father had recently died of leukemia only four days earlier, 20 March 1931 leaving his mother Ella a widow. Ella would become the sole provider for her family of two; Jean (Mary Jane) his sister, who was 12 years older, and Leslie, the newborn baby. Those days for Ella were both joyous and sad occasions. The days in March 1931 were the bookends of her life. They marked the death of her husband and the birth of his son. Life was hard for Ella but she managed somehow and survived with the help of her family and neighbours. She remained a single mother for the rest of her life. The family was greatly assisted by Leslie’s maternal grandparents and uncles, Austin and Phillip Dort. Austin, Ella’s older brother, worked at the steel plant and lived in Sydney. Austin materially helped Ella in many ways. Phillip the younger brother lived at home with her parents. Phillip helped with the day to day chores. Circumstances soon improved for the Ryter family but only for a very short while. Ella and daughter, Jean assumed the management of the Post Office in 1937. They enjoyed that privilege for a few short years from 1937 to 1939. Running the Post Office was their primary source of income. The lives and fortunes of the Ryter family improved considerably at that point. But hard times soon followed once again. Ella was diagnosed with a non-malignant tumor and required an operation in 1939. She had to give up the post office. Happily, her tumour was successfully removed but regrettably she was unable to return to the Post Office. It wasn’t until 1940 when Ella’s family finances once again improved for the better. Ella applied for a widow’s allowance. A Miss Hamilton then of Social Services reviewed her case. She inquired if Jean could assist Ella financially in any way. The government’s purse strings were as tight as ever. Miss Hamilton wasn’t about to dole out the government’s money frivolously or lightly. At this time, Jean worked at a boarding house in New Glasgow cleaning and cooking. Jean earned the princely sum of $10 a month, board included. Miss Hamilton stated that surely Jean could use some of those earnings toward her mother’s upkeep. Unfortunately, Jean’s meagre earnings barely supported her own needs much less her mother’s. Jean worked hard for her keep and earned just enough to cover her living expenses while working in New Glasgow. It was a nil sum game. Jean was unable to help her mother financially in any way, shape at all. Sadly, it was just the way life was in the day! Their situation was neither rare nor unusual. It was just the way life was. But it wasn’t all misery, doom or gloom. There were good times too! You made them. They were found in the special occasions and in daily living, while at work, or at play. You made the most of what life had to offer which was so rich in many other ways! For example, on the occasion when a young person hit the jackpot and came into a little money or could afford a treat, the princely sum of 25 cents could buy the simple pleasures of pop, chips, and a chocolate bar. Those were rare treats and were certainly appreciated. They were well-remembered. It made your day! It was the day to day routine that made the difference too and that was a blessing for those living in rural Canada at the height of the Great Depression. It just wasn’t seen that way at the time though. There were about 15 families living at Halfway Cove when Leslie was a young boy. The principal occupation was fishing. There was some forestry too. But everyone was involved in some form of subsistence farming. It was the farm and the garden that put food on the table. Leslie said “the only dollars made is what came from the Chedabucto Bay”. But for Halfway Cove when the war came little changed. The military presence in the area hadn’t change their standard of living or way of life in any way. There was no increase of work. If you wanted a job or war work, you simply had to leave. Halfway Cove was an isolated community. If you wanted heat in the winter, you cut your own firewood. There were no hydro lines or phones. The nearest electricity was at Queensport who made their power from a generator to operate the two fish plants located there. Leslie’s family hardly had two cents to rub together. But they were in the same boat as any other family! The residents of Halfway Cove all had acreage of some sort. It was the key to their survival from which they harvested wood, raised livestock, milked cows, and grew the gardens for their sustenance. They lived off the blessings of the land and sea, which were freely available to them through the fruit of their labours. The typical farm ranged anywhere from 50 to 250 acres. But only 4-5 acres were cleared. The rest was woodland and swamp. Given this range and diversity of holdings, Halfway Coves’ residents were spread out about the landscape. Characteristically, no one had electricity. Everybody had wood heat and wood stoves so they were basically self-sufficient. There was no need to fear for lack of heat or light if the power went down. There was none after all! They all relied on woodstoves for heat and coal oil lamps for light. No one needed to run to the general store either. Everyone kept a cow for milk. The Ryter family woodlot was essential for home heating that made them independent from other fuel needs and reduced their costs. But Leslie was too young to help harvest fuel wood that was necessary to heat the home. Leslie said “Mother held an annual chopping party.” It was a community event that she hosted for the help of about 4 or 5 neighbours and her brothers who would show up to bring in her wood for the winter. It was the way in the community of Halfway Cove that they saw many go out of their way to help those in need. It wasn’t money, it was their labour that ensured no one went without. The community kept everybody together and helped one another more so than the government did in the day. Times were tough but the people of Halfway Cove were rich in other ways. The heart and soul of these little communities were their churches and schools. The schools were key institutions that connected families and communities on a daily basis. The school at Halfway Cove was a fairly typical one room school house. Leslie said that there was a school house in every village. The school was always located at the center of a community. The school was at the hub and always constructed within a 5-mile radius of the natural boundaries of every community. This layout gave people options especially for those living on a community’s edge. They had the option of choosing the nearest school. They were able to split the walking distance for their children who went a school nearest the home. This cut the distance of a walk to between two and 2.5 miles. The grades taught in these one room school houses ranged from grade one to ten. Those who desired a higher education beyond grade 10, went to Guysborough. There they finished Grade 11-12 advancing to senior matriculation, and if some could afford it, advanced to higher education beyond their community. Leslie remembered his teachers at Halfway Cove. First there was Mr. Hardy, followed by Ms. Lila Heart, Sara MacAllister, Pearl Calhoon, Annie Sangster, Marion Cooke, and Lee Rhynold. Mrs. Sangster was most likely the school teacher in 1944. The layout of Leslie’s one room schoolhouse was typical of those built in the area. It was heated by wood fired in a long box stove. The stove was set in the middle of the room to maximize the radiation of heat. But the radiation of heat was often dubious at best. There were 30-35 students of all grades in attendance. One year they even had a high of 49. No matter they all sat freezing in the cold of the school room that year! During Leslie’s first year at school the wood was brought in directly from the outdoors. The wood had been exposed to the elements. Often as not, it was wet and snow covered. The wood that first year had to be laid under or around the firebox in order to dry it off before it could be reasonably burned and provide heat. The snow would sizzle to water before drying out. Then it was finally thrown into the fire box to burn closer to the end of the day than the beginning. It proved to be a long cold day for all! It was often two o’clock in the afternoon before the stove finally threw out enough heat to warm the small building. It was a problem. The children were cold and miserable for the better part of a day, and that was not very conducive to learning. The problem was resolved very shortly the next summer before Leslie’s second school year. A porch was built which added wood storage for the school house. The porch proved to be a welcome addition. The students could now hang their coats in a warm spot. More importantly, the wood was now kept dry in the new storage bin and available for instant use. All that was needed was help of the older students in fetching the wood and stoking the fire. They would now finally be warm and comfortable. But the resolution of the one problem led to another. The stove was dodgy. Leslie’s teacher feared for the very lives of her charges. The stove’s flu was an imminent fire hazard. The flu stretched through the ceiling to the roof. Both the flu and roof had seen better days. The roof was in very poor shape and was dry as a bone. It could be easily set afire by a random spark. The dubious nature of the stove pipes and flu necessitated a fire watch. Each day the older boys, two at a time, would take turns up in the attic for an hour or two, keeping watch. Ironically they sat there alone, with a lit coal lantern, in a very precarious position. In any case the school room was now a warm spot in winter. Their situation had materially improved with the addition of that porch. The fire watch made them safe. That was all that mattered. School years have natural rhythms that unfold as highs and lows each season. Those rhythms are punctuated by work, holidays, and celebration. The one social occasion that young and old enjoyed to the fullest was Christmas. Christmas was a season well remembered by Leslie. There wasn’t much money in the Ryter house. But Christmas was always well turned out and was very memorable. Leslie never anticipated very much in his stocking. With only one parent, money was always tight so he never expected much in the way of presents. Christmas was all in the preparations. Leslie remembers one Christmas when a neighbour gave the family a duck for Christmas dinner. It was cleaned, roasted and enjoyed by all. It was the Christmas bird that truly made the day. It was a time for the family to gather round the feast and enjoy their blessings. But we have to look beyond the Christmas feast too. The day to day living was just as important. His family never went hungry. They were always able to snare rabbits, and augment rabbit with a little salt pork. The combination of the two made an excellent meal. The family had an abundance too for they grew their own potatoes. The garden patch filled their pantry with abundance from what was preserved and harvested. It was their farm that ensured that they ate well and never went hungry. Leslie’s family Christmas was helped in other ways. 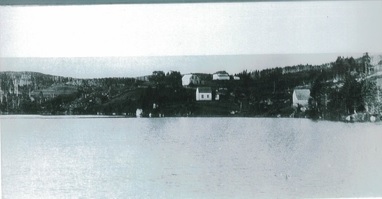 Ella’s brother, Austin, lived and worked in Sydney Cape Breton. He generously gave his sister each Christmas $20 from his wages. His gift always arrived just before Christmas. Twenty dollars was a considerable sum that bought quite a bit in the day. So Leslie and his sister Jean always had a little something at Christmas. Their stockings were hung and loaded with grapes, oranges and candy. Leslie fondly remembers his uncle’s generosity. Uncle Austin’s generosity yielded some treasured Christmas presents over the years. Leslie remembered the simple little farm set he received as a present one Christmas day. He was a very young boy. The farm was made of metal and had lead mold figures of farm animals. The figures were animated and brightly painted. He remembers building the barn out of a cardboard box (probably the box that the figures came in)! The play farm enthralled him for hours. Another year he received a novel metal fire engine. It was a remarkable piece of engineering. It shot sparks out of its chimney as he ran the engine across the floor. The friction of the wheels on floor ignited a flint in its interior works that sent sparks up the spout as he whirled it round and round upon the floor. It was a magical toy! Some Christmases weren’t so magical though. Leslie recalled one Christmas when he was 6-7 yrs old when he had food poisoning. A doctor was required and was sent for. The doctor’s verdict and diagnosis, Leslie had eaten some contaminated candy on an empty stomach that Christmas morning. Leslie was sick as a dog but he fully recovered 2 days later. It’s hard to speculate whether he ever ate candy so early on Christmas morning ever again… but I suspect that he did! In Part 1 of this article we left off with Leslie’s fond remembrances of Christmas Past and his life and time at Halfway Cove as a young boy. Christmas was fondly remembered throughout the recounting of his story. But not all Christmas were remembered that way. In all the jumbles of Christmas past, Leslie especially remembered the Christmas of 1944. It began as a simple one. He was much older, 14 at the time. There still would be presents from Santa under the tree. He did not recall what he received that year. Leslie was now one of the older boys in the community. He recalled that Halfway Cove was very alive with the Christmas spirit that year. It was a such joyful time with everything leading up to the big event, Christmas day. Dances, pie socials, and live entertainments were held. A musician from Queensport showed up and played accordion that greatly entertained all in the community. It was such a joyful happy time. The festive season was also festooned with recreations, sleigh riding, and coasting. There was joy and happiness in the air. Happier still, school was out on 20 Dec. The school already had its annual Christmas concert some days earlier. There was nothing left to do now but count down the days to Christmas and enjoy the season; except that for Leslie, there were still chores to do! Leslie was now the man of the house. He was now responsible for chopping and stacking wood for the fire. He was now 14 years old and in a few short years, would soon be off in the world. All his work was done by late in the day on 20 December. Leslie was out and about looking for his friends. It was dark and snowing. But death was lurking in the shadows and the Christmas season was about to turn deadly in the tiny community of Halfway Cove. It happened that some servicemen were travelling through by truck that day and were on their way home for Christmas. They were heading to the station at Monastery for their trip home. They didn’t make it past Halfway Cove. Their truck was involved in an accident. Leslie said that there was heavy snow on the road at the time. The scene of the accident happened very near his home at Halfway Cove, one half mile away on the road where he lived heading towards Canso. Leslie had not witnessed the accident directly. He arrived on the scene after the fact. But he was privy to the events in its aftermath. From what he saw, the cause of the accident was obvious. The truck was proceeding down a hill with some military men in the box on the back of the truck. The truck lost its footing and slipped off the road over an embankment and then rolled. 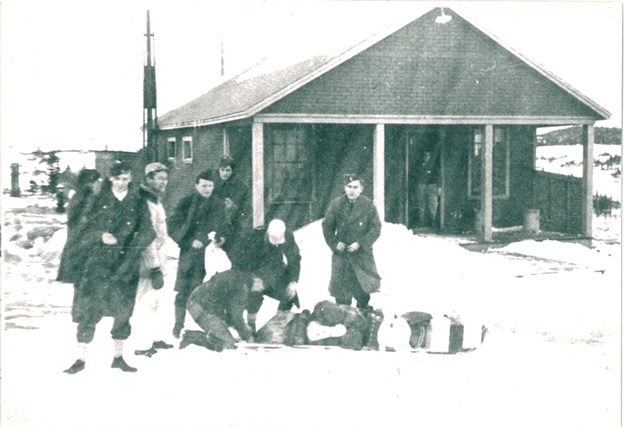 Leslie estimated that there were 4-6 men in the box from the casualties that were spread upon the ground. The accident happened very near a telephone/electrical pole on the road. That pole came to have a big role in the rescue later on. Photograph below: Looking towards Queensport – main body village today. This is the probable spot today. We’re looking uphill here towards Queensport. The Army truck would have been proceeding downhill toward the bridge on the day. You can see at the top of the hill a curve bending to the right from this perspective. The truck would have been coming in the opposite direction around the curve, lost its footing and tumbled down over the embankment. The power/telephone line on the left lower corner of frames lines up hill with the details of the accident from Leslies’ memory of the events in 1944. Leslie arrived on the scene shortly after the accident with 3 or 4 of his friends. He remembered Donald George, Donald’s brother and several others being there too. They were all eager to help in anyway. But they were much too young. They were only boys of 13-15 years of age and were told to stay out of the way. However, while standing around, it was very clear to the boys that some men were trapped by what appeared to be a heavy box. The rescuers struggled in vain to move that heavy box. The box was being transported in the back of the truck with the airmen who were heading home for Christmas. The box was dislodged in the rollover. An example of how men and material were transported. In the jumble and tumble of the rollover, it happened that the box subsequently trapped a leg of one of the passengers when it finally settled. It was an unfortunate circumstance. 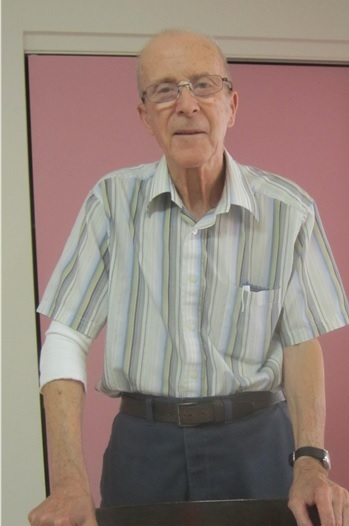 The man’s leg was suddenly lodged across the throat of Ed Flower. That leg was pinned and could not be dislodged because of the weight of the box. There was indeed a sense of urgency to the desperate efforts taken by the rescuers. But it was all to no avail, neither the leg nor the box could be moved in time. Ed was pinned to the floor of the truck and life slowly eased out of him. A Bren gun carrier happened to be in the area, and was brought into the fray. A rope and tackle set was hooked up between the truck and the Bren gun carrier. The Bren gun carrier then attempted to set the truck upright. It was not enough. All efforts failed. They needed leverage. Finally, they realized that a telephone pole could be used as leverage point. The block and tackle was reset and another attempt successfully dislodged and set the truck upright. The pressure and strain on the pinned leg was gone and the box easily removed. But the effort was far too late for Ed Flower. By this time Ed Flower was dead, the life choked out of him. Leslie witnessed the extraction of Ed Flower’s body. Ed’s lifeless body lay on the ground. His face was blue as he laid there peacefully in the headlights of the rescue vehicles upon the cold winter ground. It was dark and gloomy beyond those headlights. Leslie’s opinion and that shared by many there, was that this accident was both a needless and a senseless tragedy. It was the box of heavy equipment in the back that was the problem. The accident would have been survivable if the box hadn’t been there. The truck wasn’t travelling at great speed because of the snow on the road. It simply slipped over the edge and tumbled down the ditch, pitching all its contents to one side. If its cargo was all men, they simply would have been tossed about like rag dolls. Our servicemen probably would have laughed it off, dusted themselves off and gotten on their way. The box though made it a deadly enterprise. The box was an immoveable projectile and where it finally rested had tragic consequences. Mickey Stevens photograph – Archives of Mary Richard with permissionIt was a sad Christmas. Nature played a cruel trick of fate. No 5 Radar Unit’s own transport was still stuck in the snow because of a blizzard the day before. The vehicle wasn’t cleared in time for the transport to Monastery. The arrangements made with the Army to hitch the ride to the station had unintended consequences for all. There was no malice in the act. It was simply a goodwill gesture to provide assistance to other service men to get them home and on their way in time for Christmas. “Getting home for Christmas” was the one desire and hope shared by all, but duty often intervened. So if they could make just one serviceman happy that Christmas, it was worth helping out. The truck used to transport the men was merely on a routine service run. The men sat in the back amongst the paraphernalia of war to get to their destination. It was a normal procedure. All this was done with good intentions when suddenly fate lent a hand. Fate dashed all those good intentions that lead to disaster. The scene of the event remains with Leslie to this very day. Two short years later Leslie turned 16 and would leave Halfway Cove. He quit school and went to work full time in 1947. 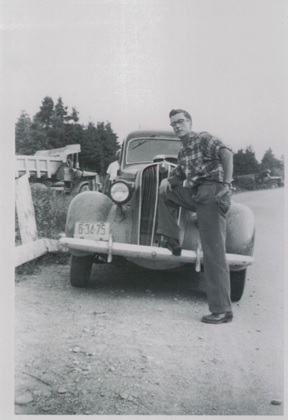 His first job was building highways in Guysborough County. 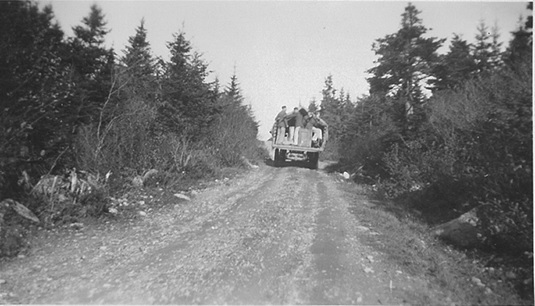 He worked on the stretch from Guysborough to Canso picking stones for the road as there was no crushed gravel available at the time. That material was surface mined in the area of Dort Cove and Halfway Cove. It was hard work as they used only shovels. He did this for two months then went to work with his brother-in-law land surveying and working on a transit crew. Leslie worked a number of jobs and moved from opportunity to opportunity to improve his lot in or near Guysborough County. But he finally took the big plunge when he was 25 Years old. Leslie moved to Halifax. He worked at a number of jobs there, first at Perley Brothers doing maintenance on Naval Ships (9 months), then at Halifax Wholesale, where he subsequently was transferred to Halifax Wholesale (New Glasgow depot) for a time. Leslie was a hardworking man. He took whatever he could to make a living. His big break came in 1958. He landed a job at the Halifax Vocational School, then on Bell’s Road. Leslie worked there for 25 years. It proved to be a fortuitous opportunity for this is where he met his wife Mary. They married and raised a family (1 girl – 4 boys). Looking back over old times, Leslie remembers his starting salary in 1958 at the Vocational School. It was $1950 annually. It wasn’t enough to sustain his growing family so he started a small moving business on the side to supplement his income. The job at the Vocational School and the moving business proved to be the right combination to buying their first home. Like many families in the aftermath of the Second World War, Leslie and Mary pinched pennies and saved the $150 down payment to purchase their first family home in Dartmouth. It was valued at $1500. They bought it in 1966 and lived there until 1981. Leslie looking to his retirement wanted to return to Halfway Cove and started building a home there in in 1980. His wife Mary moved in on its completion in 1981 but Leslie had to remain in Halifax for a time. He finally returned to Halfway Cove for good in 1982 when was able to retire from the Vocational School. Leslie then in his early 50’s, took a job working the watch on fire towers each summer off Lundy Road. He did this for 9 fire seasons until he reached 60 years old. It was a good life.